Brisbane has been home for 8 years now - with the help of two energetic young girls it is a great place to discover. If you feel like being immersed in the flavours of Italy, Classi Di Cucina Italiana could be a perfect option for you. Nestled in Rathdowney, a visit to this cooking school offers an opportunity to escape from Brisbane, perfect your cooking skills and sample the Italian delights. Desley and Pietro Agnoletto are perfect hosts and would already be familiar to many Brisbanites. They are perhaps better known for creating the Schonell Pizza Caffee at UQ some years ago. Back then their pizzas quickly gained a reputation for being scrumptious and the cafe became a popular stomping ground for students, academics and the general public. Desley and Pietro now reside in Rathdowney, part of the Scenic Rim. This region enjoys a flourishing boutique food industry and makes their property a perfect place to conduct the classes. Approximately 90km from Brisbane and although "off the beaten track" it is easy to find. Once there you immediately relax in the peaceful surroundings enhanced by the menagerie. Our class, at one stage, was interrupted by a hungry baby alpaca who required bottle feeding - an unusual but enjoyable interruption indeed. Classi Di Cucina Italiana offers a variety of classes. We opted to attend Pizze Alla Pietro. In my family we make pizzas once a week so it was with some reservation that I headed to Rathdowney to learn an art I thought I had already mastered. As soon as we arrived my misgivings vanished and I knew we were in for a treat. The class is conducted in a kitchen which contains a large wood-fired pizza oven. This room opens to a large deck area overlooking the picturesque property. Unfortunately during our visit it rained persistently so we could not utilise the deck however a long dining table in the kitchen sits everyone comfortably. All "students" are encouraged to fully participate in the cooking. The banter is lively and the atmosphere jovial. 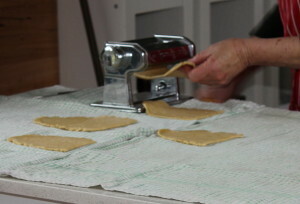 Our class began with the making of crostoli - a popular Italian treat. After watching and listening the opportunity arises to cook our own. Needless to say we sample our creations. Washed down with a strong cup of coffee, it is a perfect way to get the morning started. Our attention turns to dough making and I soon realise that I have been eating sub-standard bases for years. As it transpires there is a real science to making pizza dough. Whilst divulging the "tricks of the trade" our hosts provide a brief background on the foods we are using and this is intermingled with anecdotes of their own personal history. Desley suggests and selects various pizza toppings from her "A-Z" list made famous at the Schonell. The pizzas are generally traditional. Everyone has a turn at kneading the dough, creating the toppings and of course "shovelling" the pizza into the wood-fired oven. There is a knack to be mastered in all of these steps. The most important thing we learn is "less is more" when it comes to enhancing flavours. A few surprise combinations certainly won us over but none more so than the "dessert" pizza. Strawberries, stewed apples and cream cheese on pizza? In a word - delicious. Home-made gelato is the perfect complement. Accompanied with a bottle of red wine from a local vigneron we conclude that we are absolutely bursting and could not squeeze in one more slice - not even wafer thin. Recipe sheets are provided and for the diligent there is plenty of time to add your own notes. Once the class has concluded Desley and Pietro do not rush you out the door. On the contrary they seem to enjoy the opportunity to sit and chat with their satiated students. The surrounding gardens are a work in progress, with sculptures planned for certain areas. Although not yet complete they still offer a sense of tranquility. A new kitchen is also being built and will adjoin the "pizza building". The whole setting provides an enjoyable change from a class in a commercial kitchen. Other classes on offer include Veneto Banquet, Pasta Master Classes, Gnocchi, Risotto & Gelato and Fabulous First Courses. Desley and Pietro are more than happy to conduct classes in your home and the cost of this is dependant upon the distance they would be required to travel. This experience can be squeezed into a day trip. If you would prefer to enjoy your surroundings for a little longer visit Scenic Rim Escapes for accommodation in the area.